At Bresnahan’s we aim to provide premium quality meats at the best prices, whilst delivering excellence in friendly customer service. Unlike the larger chain stores and supermarkets, we get to know our customers. You can come in to our butcher shop in Mortdale and we will make it our business to accommodate you as best we can. We have our well stocked display fridges with some great pre-cut meat selections that should inspire you to create a memorable meal for any budget. We are full of great ideas and have lots of advice on how to cook that particular cut. If your recipe calls for a certain cut of meat, just talk to our experienced and qualified butchers and they can prepare it for you, no request too hard or too small. 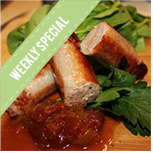 Click here for our weekly specials, showcasing our finest products. Congratulations to our recent BBQ Competition winners! Enter our "best of the bbq" competition now in store or on our Facebook page! There are NEW PRIZES with every draw!